Home Movies Parwaaz Hai Junoon poster is finally out! Parwaaz Hai Junoon poster is finally out! Momina and Duraid Films and HUM Films unveiled the theatrical poster of the much-anticipated movie of the year Parwaaz Hai Junoon at The Arena Cinema, Bahria Town Islamabad. 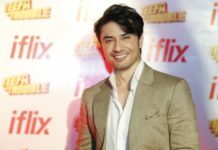 Present at the event were two of the main leads of the movie Hamza Ali Abbasi and Hania Amir, producer of the film Momina Duraid, director Haseeb Hasan, President HUM Network Ltd. Sultana Siddiqui, CEO HUM Network Duraid Qureshi and other dignitaries. 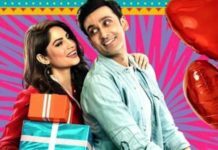 After releasing five character-posters of the movie earlier, expectations were high for the first official poster and first glance at the poster makes one fall in love with it. 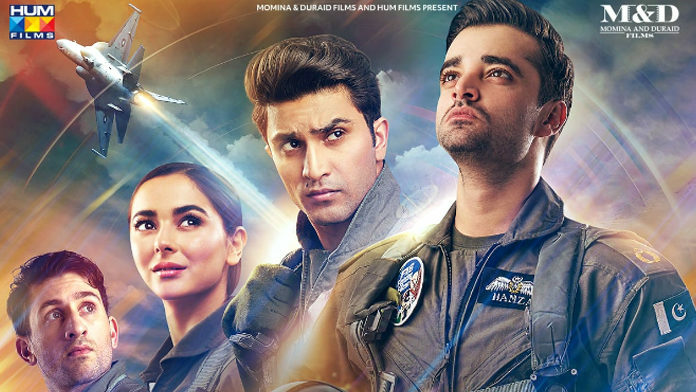 The poster features Hamza Ali Abbasi, Hania Amir, Ahad Raza Mir and Shaz Khan, and with facial expressions of the cast, the vast skies, brilliant lighting effects and the fighter jet in the background – Parwaaz Hai Junoon promises to be an intriguing tale of cadets and their flights to success. Hamza Ali Abbasi, in a never seen before avatar breathes life into his portrayal of a cadet. Whilst Ahad Raza Mir oozes an intensity which is in line with his disposition. Leading lady Hania Aamir, with a sparkle in her eyes plays a one-of-kind female character for Pakistani cinema, celebrating the equality embedded in the Pakistani Air Force, whereas critically acclaimed actor. Shaz Khan returns to the silver screen with yet another meaningful character. 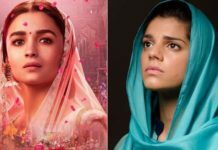 Not just these character posters, they even released a Kubra Khan’s poster giving us a major wedding vibes. 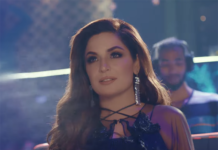 Written by the legendary Farhat ishtiaq, Parwaaz Hai Junoon is directed by Haseeb Hasan and produced by Momina and Duraid Films. The movie will be released worldwide on Eid-ul-Azha under the banner of HUM Films. PR being done by 1NFLUENCE. 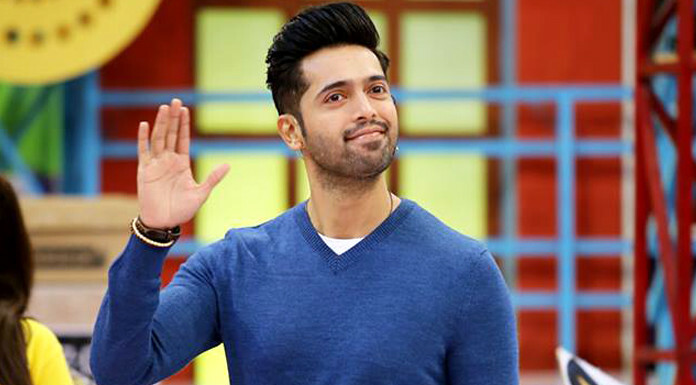 Fahad Mustafa to host opening ceremony of PSL Season II?